Have you had your weekly inoculations against boredom? Click here to play! 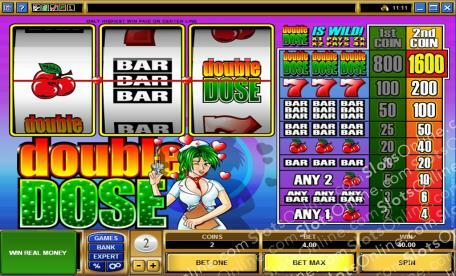 If not, then the Double Dose slots have a results based treatment that has cured many players of their No Jackpot Blues after only a few spins. Don't worry, though, it's a home remedy, so you won't need special assistance to treat yourself. Now, it is important to follow the correct procedure if the Double Dose slots are to work. These are 3-reel slots, so it should all be quite straightforward. First, takes 2 coins of your preferred value and play for the max bet. This will unlock the major jackpot amount, which is known to have the best results when correctly applied to a case of boredom. Secondly, simply keep spinning the reels until symptoms of boredom no longer persist. You may find that a treatment of red cherries, BAR symbols or lucky 7s will do the trick, but chronic cases of boredom may require a bit more. In such circumstances, the Double Dose Logo symbol may be necessary. Three of them win the jackpot, which is widely considered to be a panacea for cases of boredom. Oh no. Reading all of that seems to have worsened your condition! It is of the utmost importance that you start a course of treatment with the Double Dose slots, stat! Quickly now, before your boredom becomes terminal! The Double Dose Logo is wild in this game, and it can substitute for any other symbol. The prize payouts of combinations using substitutions are also increased. When 1 substitute is used, the payout is doubled. When 2 substitutes are used, the payout is quadrupled.